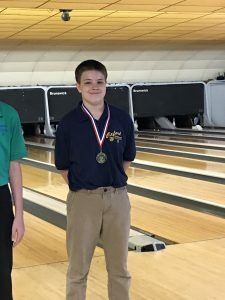 Trey Williams from Oxford is a new bowler, just started this year but it’s a good bet he won’t stop bowling any time soon after he pulled off a victory in the 2018 Metro Conference Singles Tournament in his home house Collier Lanes on Sunday, May 20th, 2018. 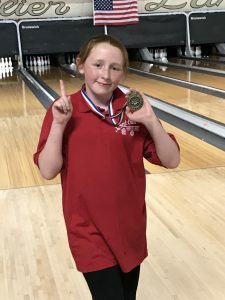 Grace Lemelin from Swartz Creek also pulled off a first as she qualified 4th and worked her way through the field to win the girls singles title. 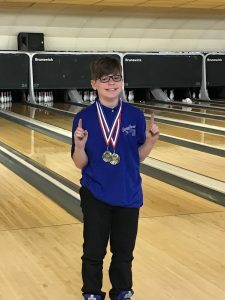 The 2018 Singles Tournament had 100 total entries, there were 68 boys and 32 girls bowling today making it the largest middle school singles tournament ever in the 8th year that this tournament has been ran. Bowlers began the day by bowling 3 games for qualifying and the then the top 16 girls and top 32 boys moved on into match play. The top qualifier for the girls was Nicole Kalisz from Davison with a 3 game total of 705 with handicap. Nicole also had the high handicap game of the day as she started the day with a 192 actual that turned into a 274 game with handicap. Nicole was honored with medals for high game of the tournament and the high qualifier. On the boys side after qualifying we had a little excitement as Brandon Hoover from Davison and Chase Volz from Flushing tied for the final spot in the step ladders. They had to do a 2 frame roll off that ended in a tie the first time and then ended tied again after the second time. The third time was the charm for Brandon as he defeated Chase 38 to 26 to move into the step ladder match play. 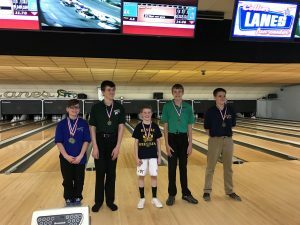 The high qualifer for the boys was Austin Huyck from Carman Ainsworth with a 715 total for 3 games and Austin also had the high game of the tournament with handicap as he had a 208 actual his first game (also his first 200 game ever). That score turned into a 280 with handicap that turned out to be the high game of the tournament for the boys. As the girls moved on in match play the 16 seed Lizzy Springsteen defeated the #1 seed Nicole Kalisz in the first round and Grace Lemelin from Swartz Creek (#4 seed) defeated Molly Peterson and Kaycee Boone to move into the final 4. On the other side of the bracket #2 seed Kalle Harris from Lake Orion defeated Lydia Boggs from Kearsley and Kaitlyn Peck from Oxford to move into the final 4. 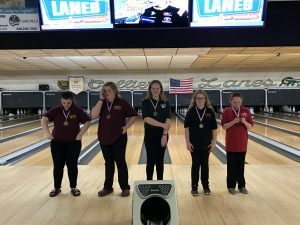 Samantha Bean from Flushing defeated Paige Morris from Lake Orion and Gabriela Alomar from Bendle to make it to the final 4 and bowl against Kalle Harris from Oxford. In the final 4 Grace Lemelin defeated Lizzy Springsteen 214 to 180 and Samantha Bean defeated Kalle Harris 213 to 193 to set up the finals of Lemelin against Bean. 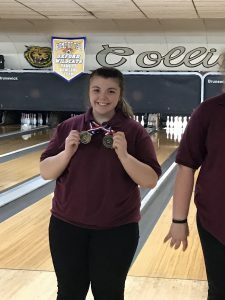 In the finals the 2 girls went back and forth until the 10th frame and as Grace stepped up on the lane to finish she needed a mark to win and she ended up throwing 2 strikes and finished with a 9 count to defeat Samantha Bean by a final score of 220 to 205 and win the tournament. When Grace was asked if she knew she needed a mark she said her coach wouldn’t tell her and she was just happy to come out on top. Congratulations to Grace and Samantha for making it to the finals, it was a fun final match to watch. For the boys it just happened to be Trey Williams day. Trey from Oxford was the 2nd high qualifier with a 711 total and he didn’t stop when he got to match play. Trey had games of 216, 232 and 193 to move into the final 4 and on the other side of the bracket the #10 seed Kasey Hendricks was taking care of business as he had games of 200,204 and 219 to move into the final 4. The final 4 featured Trey Williams from Oxford against Cody Summerfield from Lake Orion and Kasey Hendricks from Bendle against Chaz Orsette from Lapeer. The first match Trey won 203 to 182 and the other match Kasey Hendricks won 198 to 169. 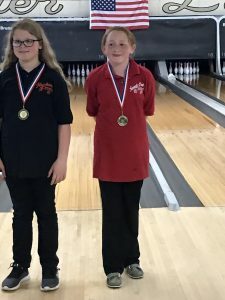 The final match was back and forth but Trey Williams proved to be too much and in the end he defeated Kasey Hendricks by a final score of 247 to 210. For both of the boys in the final this was their first time bowling in a tournament and this year was their first year bowling for the school. When Trey Williams was asked if he wanted to say anything about his victory like he has been working hard on his game or anything, his response was: “This was fun” and ultimately that is what it is all about. 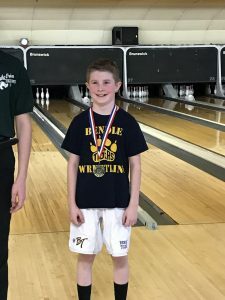 Congratulations to Trey, Kasey and all of the middle school bowlers on a great tournament in Oxford today.